Great location and huge space! Loved the area and really enjoyed how close this place is to the train line. Cool spot, excellent host, great location. My sons and I really enjoyed staying at this location. We are big guys and had no issues with the space. The beds were super comfortable. The shower was great, really hot water with excellent pressure. The apartment is less than 5 mins from the metro and finding a taxi was never an issue. Super markets and drug stores are 5 to 8 mins away respectfully. Sean, the host, is really amazing very accommodating and helpful. He’s even created a website with his recommendations for food and the like. You can’t go wrong, if I ever find myself in Kyoto again I hope this apartment is available. Sean, thank you for everything your apartment made our stay in Kyoto that much better. Great location and host - highly recommend! The apartment is exactly as advertised. It’s in a quiet neighbourhood, within walking distance to a number of attractions, and on the main subway & bus routes to get to the vast majority of attractions and hang-out spots. There's plenty of room (especially by Japanese standards) and all the basics. We especially appreciated the coffee and cream, and all the soaps/shampoo/etc. Sean is a wonderful host. His electronic site/map was super helpful throughout our stay, and he was incredibly responsive both before and during our trip. - If you want to dine at a specific restaurant, I highly recommend making reservations. You’ll never go hungry as there are tons of options, but you may not get your first (or third) choice if you just walk in (although maybe Golden Week made things worse for us). Sean is more than willing to help with reservations if the restaurant only speaks Japanese (and you don’t). - Even in crowded touristy places there are amazing spots of peace & quiet. Ask Sean about his favorites before you head out. Moon Room is conveniently located & charming & modern in its decor. It’s perfect for 4 adults or less. I would say any more would be a tighter squeeze unless everyone knows & likes each other a lot! 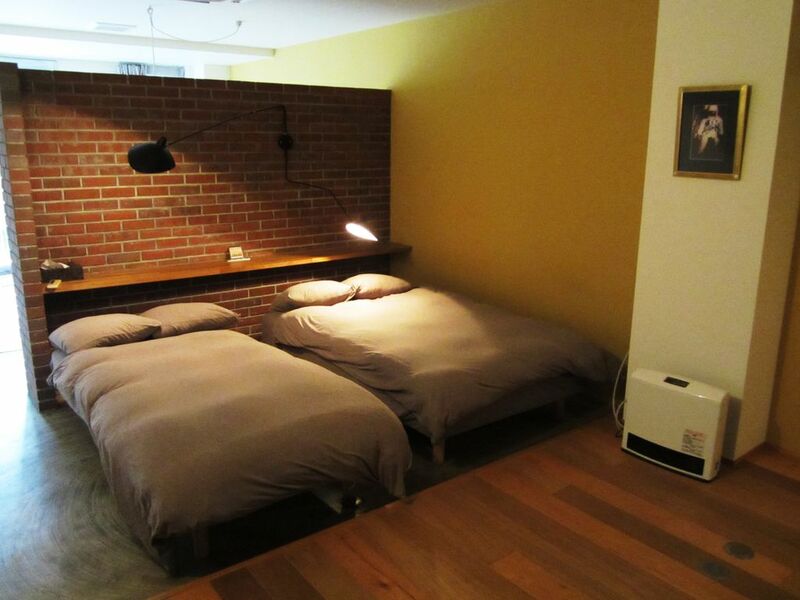 A full sized bed next to a twin are shown in the main photo & behind the brick wall is an additional small living room/sleep space. The kitchenette is truly a small kitchenette with an electric burner, toaster oven & mini dorm size fridge. No microwave. Good for breakfasts. Not for preparing say a dinner for a few people. The reason for 4 stars instead of 5 is while the space was mostly clean, the areas under the bed & on the shelving area (dishes, cookware) were dusty. I know Sean has the room cleaned professionally but his cleaning crew could be more thorough. It’s obvious that the kitchen isn’t used often with many good, nearby food options, but it would be nice to have clean cookware when it’s needed & not have dust when something drops under or at the head of the bed area. Otherwise, Sean is a gem. He is the most responsive, kind & gracious host. He was quick to respond to every and any question or issue we had prior & during our stay. He also provided lots of info about the area & detailed instructions on how to locate his place giving options should we be traveling light vs carrying lots of heavy luggage. He also offered to help my daughter who inquired about getting tickets printed to a venue. We SO appreciated his conscientiousness, accessibility & his follow up. For that reason, we would happily rent from him again. Thank you again, Sean! Great apartment, good location and attentive host. Fairly large apartment, very close to Imperial Palace, Nijo Castle, subway station and major bus routes. Sean was very attentive and responded quickly when we had a question.